As South Africa presents its first human rights compliance report to the United Nations Committee on Economic, Social and Cultural Rights, CSOs call for a human rights-based approach to fiscal and economic policy, steps to tackle corruption and increased funding for healthcare and education. Johannesburg / New York, 10/01/2018— SECTION27, the Institute for Economic Justice (IEJ), and the Center for Economic and Social Rights (CESR) are urging the South African government to roll back austerity measures and instead pursue fairer economic alternatives in compliance with its human rights obligations. The organizations argue in a submission and accompanying factsheet to the United Nations Committee on Economic, Social and Cultural Rights that austerity policies are undermining human rights in South Africa. The submission is made on the occasion of South Africa’s first appearance before the Committee on the implementation of its obligations in terms of the International Covenant on Economic, Social and Cultural Rights, taking place in Geneva this week. The Covenant closely mirrors the social and economic rights guaranteed in the South African Constitution. Despite the more inclusive economic and social agenda initiated by South Africa’s democratic government after 1994, enjoyment of the rights laid out in the Covenant and Constitution remains elusive for the majority of people. South African government expenditure per person has declined for three years in a row and since 2016/17, expenditures for social and economic programmes have grown only 0.3%. This year government increased the value-added tax from 14 to 15 percent, disproportionately impacting poorer households, reducing their disposable income and potentially increasing levels of poverty. The acceleration of austerity comes in response to pressure from credit rating agencies, panic over public debt levels, and lower than expected GDP growth and revenue collection. However, the country’s debt levels, projected to peak at 56.2 percent during 2021/22 and 2022/23, are similar to those of other emerging markets and lower than most developed countries. 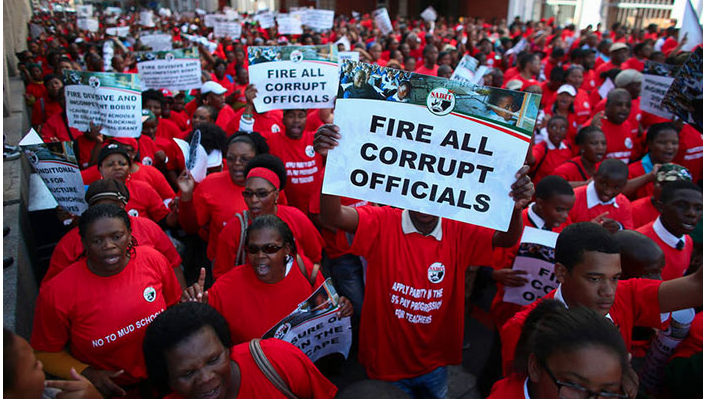 Widespread corruption and ‘state capture’ during the Jacob Zuma administration has reduced revenue collection, undermined social service delivery, and led to increased debt and severe mismanagement of critical state-owned enterprises. Systemic inequality and widespread poverty persist, as nearly 50 percent of the country lives below the poverty line while the wealthiest one percent owns half of all assets in the country. In this context—where huge numbers of people rely on government services and support simply to survive—cutting government spending on social programs and services will be catastrophic for economic, social and cultural rights. The realisation of these rights, including the rights to health and education, is already being undermined by austerity, reinforcing long-standing apartheid-era inequalities in those areas. • In recent years—with 80 percent of the population uninsured and the health system heavily overburdened—health expenditure per uninsured person has declined. • Due to limits on personnel expenditure, most provinces suffer from chronic staff shortages, eroding the quality of care available to the most marginalised communities and resulted in huge medico-legal bills. Education is faring no better. • Funding cuts to much needed school infrastructure programmes and underfunding of the country’s poorest schools have left many schools in dire condition. • Children have died as a result of poor school infrastructure, with two students drowning in broken school pit latrines. Progressive tax reform and tackling corruption are alternatives to austerity that can help South Africa fulfil its human rights obligations. Although South Africa’s current tax system is progressive, it needs to be much more so given the depth of inequality in the country. • Tax breaks for high-income earners cost over 52 billion Rand in 2015/2016. • Corporate tax rates are amongst the lowest in emerging markets. • Trillions of rand have been lost to tax evasion and other types of illicit financial flows over the last decade. Alongside tax, billions of Rand a year are estimated to be lost each year through corruption. Last year, irregular, wasteful and unauthorised expenditure amounted to nearly 50 billion Rand—more than the total budget shortfall. The Covenant commits South Africa to maximising the resources available for the fulfilment of rights. In line with this commitment, South Africa must take immediate action to increase spending on essential public services and explore fairer methods of taxation that result in greater redistribution and enable a shift towards the people-centred, rights-based development envisaged in the Constitution. As civil society organisations we call on the South African government to reverse its austerity policies and take immediate action to fulfil its constitutional and international obligations and ensure the realisation of socio-economic rights. The submission was drafted by the Center for Economic and Social Rights (CESR), Section27 and the Insititute for Economic Justice and is also endorsed by: Alternative Information and Development Centre, Equal Education Equal Education Law Centre, Public Service Accountability Monitor, Rural Health Advocacy Project, and Studies in Poverty and Inequality Institute (SPII). Nomatter Ndebele, SECTION27, Johannesburg, ndebele@section27.org.za, +27 72 919 2752. Terry Roethlein, CESR, New York, troethlein@cesr.org, +1 718 237 9145.